The ultimate in vapor barrier protection. Three layers 'sandwiched' together to prevent the intrusion of contaminants and/or water vapor intrusion. Click here to view foil bag available constructions. Triple Laminated Water Vapor, Oxygen and contamination barrier foil bags. Custom made to suit your requirements. Provides zero atmosphere to valuable contents. Meets or exceeds other foil/poly vapor barrier films in the market place. Picture shows a 40 inch x 40 inch x 95 inches high custom made vapor barrier foil and poly laminated bag for the corrosion protection of gaylords of auto parts shipping overseas. 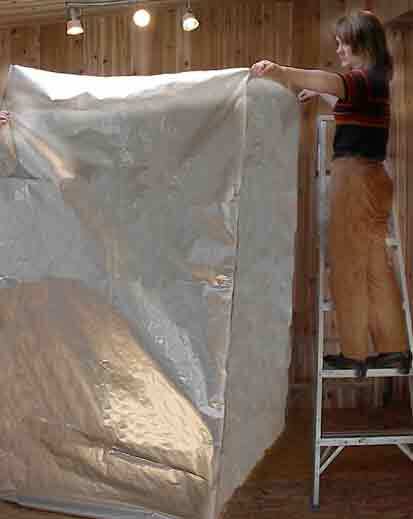 The foil bag is used to provide a water vapor barrier to the contents inside. Inside pack consists of powder-coated metal parts that are packed into cardboard boxes. Each cardboard box contains parts that are inter-twined (interleaved) with VCI corrosion control paper. The small cardboard boxes are closed and stacked inside the foil bag that is used as an inner liner for shipping crates. Contact Kpr Adcor Inc. for details of custom made foil laminate sheets, rolls, bags, gusset bags and more Toll Free: 1-866-577-2326 or click to download vapor barrier foil product data sheet. The graph above demonstrates the water vapor transmission properties of various plastic film constructions. Our Tri-laminate foil barrier film is at the top of the chart with the lowest values. A lower water transmission rate is better. The chart below compares our Vapor Barrier Film 12990 performance specifications to other commonly known vapor barrier foil laminates in the industry. 0.0005 gm/100 sq. inch; 24 Hrs. 0.005 gm/ 100 sq. inch; 24 hrs. 0.003 gm/ 100 sq. inch; 24 hrs. 500 degree F/ 3 Sec.